We're always looking to further improve our fleet, so needless to say, Facelift didn't come home from Vertikal Days empty handed. We purchased two new Multitel SMX 225 and 10 new Niftylift HR 17s at the show. The super low weight Niftylift HR 17 four wheel drive really is head and shoulders above the rest, with one of the most impressive working envelopes in its class. Its compact base allows it to manoeuvre easily in enclosed spaces, while its low weight means that less fuel is used, keeping operating costs lower. It's also suitable to be used in a range of different environements as its traction means it can be used on even rough and uneven terrain. The 1.8 metre wide cage, offers ample space for materials and tools, meaning it is perfect for even complicated jobs, while its 150° fly-boom with 180° cage rotation means that the cage can be positioned with absolute accuracy. The tough, impact-resistant composite base and cross-section steel rails give also additional strength and durability. In addition, it comes complete with the award winning SiOPS technology, which warns when there is a risk of entrapment, giving additional operator protection. 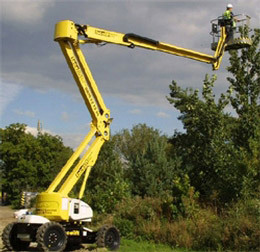 Similarly, the Multitel is a versatile, tracked spider platform with a noteworthy working height of 22.5m, and at just 2500kg it is light enough to be towed by a 4x4 on a standard trailer. Suitable for either indoor or outdoor use, it can be powered by either a diesel engine indoors, or 110v or 240v indoors. When narrow jacked, the machine is only 2.9m wide, making it suitable for use in confined indoor spaces such as corridors and hallways.